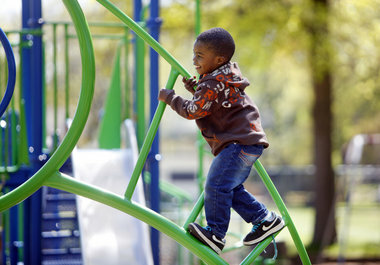 Emily Zoladz | MLive.comAdinose Taylor, 3, of Grand Rapids, climbs on the playground at Garfield Park last month. Grand Rapids has been named a 2012 Playful City USA by KaBOOM! GRAND RAPIDS, MI â In line for a possible $15,000 grant from Sprite, city parks also could get up to $30,000 from Dr Pepper. Grand Rapids is one of 213 Playful City USA communities being recognized this year by the Washington, D.C. non-profit KaBOOM! for efforts to increase play opportunities for kids. Two other Michigan communities, Holly and Luther, also made the list. “KaBOOM! also liked the fact that the city took the initiative to revamp the Adopt-A-Park program because that increases citizen participation in the maintenance of parks/playgrounds which, in turn, typically boosts the lifespan of park/playground amenities, equipment” and the like, he said. A new “Parks Alive” partnership between the city and Friends of Grand Rapids Parks is being developed, said James Hurt, city director of public services. Other communities are getting Playful City designation due to a variety of parks programs such as “Sunday Parkways” in Ferguson, Mo. where streets are closed to cars so that people can play in the streets, and a Providence, R.I. Fun Bus of sports equipment that travels around to start games with kids. Playful City USA communities are eligible for grants of $15,000 to $30,000 through a partnership with Dr Pepper Snapple Group. Recipients will be announced next month. Grand Rapids last year got two $30,000 Recreation Passport grants from the Michigan Department of Natural Resources, one for basketball court and restroom improvements at Martin Luther King, Jr. Park, 800 Fuller Ave. SE, and one for playground upgrades at Roosevelt Park on Grandville Avenue SW. This city this year is seeking two more Passport grants: one would help fund resurfacing of six tennis courts at Aberdeen Park, 798 Evelyn St. NE, and the other would help pay for 3.5 miles of natural-surface mountain-biking trails at Richmond Park, 1101 Richmond St. NW. Also, a 2012-2013 city budget proposal includes $71,100 for 26 additional miles of bike lanes as the city strives for 100 miles by 2017. In addition to potential Playful City funds, Grand Rapids will get up to $15,000 from the Sprite Spark Parks Project for improvements to the shoddy basketball court at Westown Commons park, 752 Watson St. SW. With online voting set to run through the end of the month, the city court ranks 4th out of 25 across the country.